HOWTO – High current USB charging ports. Having been playing with a Raspberry Pi recently I’ve written some logging software and left it powered to collect a decent amount of data. However it’s become quite a nuisance having a slightly-too-short network cable strung across to my desk, plus, let’s face it, my desk has enough clutter on it! 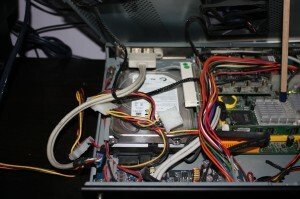 As I have a small server on 24/7, it seemed an obvious source of power, however I was reluctant to simply plug it into the (Mini-ITX) motherboard’s USB ports as I was concerned that they may well not be man enough for the required 700mA to power the Pi. 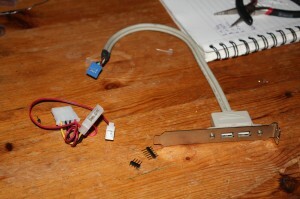 The raw materials consisted of an old motherboard’s extra USB ports mounted on a PCI blanking plate, a cheap and nasty Molex -> Fan connector adapter and a few header pins left over from a recent project. 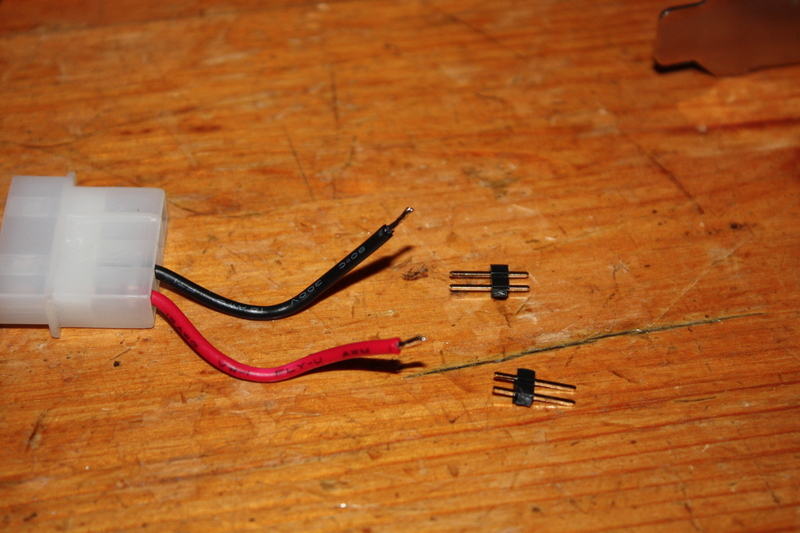 I decided to use a dedicated molex plug as there are a couple spare inside my small server, so I removed the extra cables from the fan adapter and simply had connections for 5V and ground. I didn’t have the correct pin removal tool, but the pins came out quite easily with a little poking from a narrow knife. I then stripped and tinned the cables appropriately. 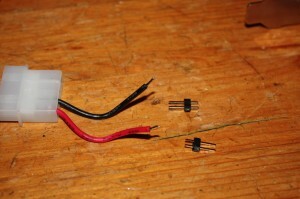 I made sure that the cables would connect with a pair of pins by bending the ends into a J-shape and applying plenty of solder to make a good contact with both pins. Here you can see I’ve inserted the header pins into the appropriate connections on the motherboard USB connector for ground and 5V. I’ve melted the plastic together with the tip of the iron to make sure that they don’t come apart inside the case. You could use a small blob of superglue if you prefer to avoid the hot plastic smell! A bit of insulating tape to make sure that it doesn’t touch anything it shouldn’t and we’re ready to go. 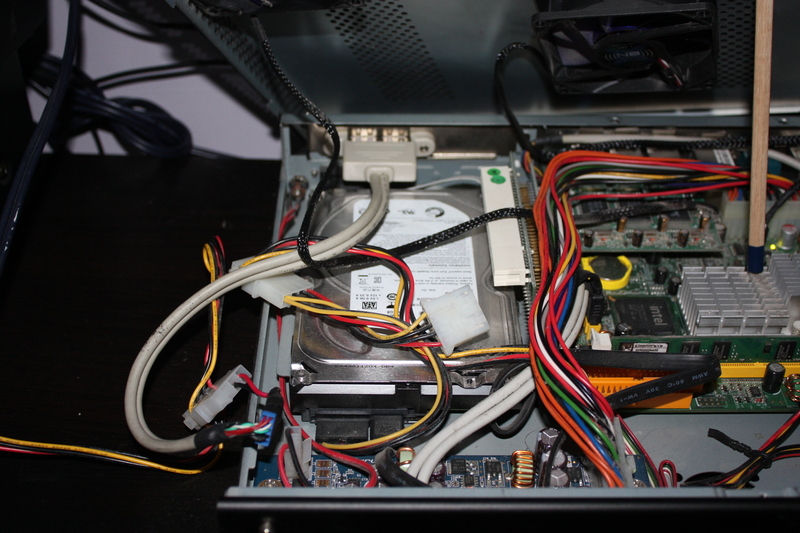 Here you can see the finished adapter in place in my server connected to a spare molex drive connector. The only remaining job was to squeeze the spare cables out of the way of the fans and get the lid back on the case! And here’s the final result – my Raspberry Pi running happily from the new adapter. Also useful for charging phones and other devices that use USB chargers. 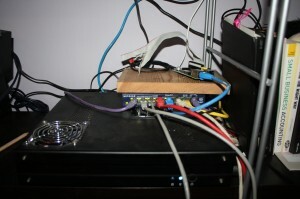 The strange nest of cables on top of the Pi is a Sparkfun temperature sensor breakout board connected to the Pi’s GPIO pins via a recycled floppy drive cable. So there we have it, a few spare parts lying around and a few minutes soldering meant that I could happily power my Raspberry Pi without risking damage to my motherboard’s USB ports. I’ve one less cable to trip over and a little bit less clutter on my desk. That’s not clutter, that’s carefully thought out wiring. Oh, OK, it might be clutter, but clutter away on a shelf is better than clutter on my desk! 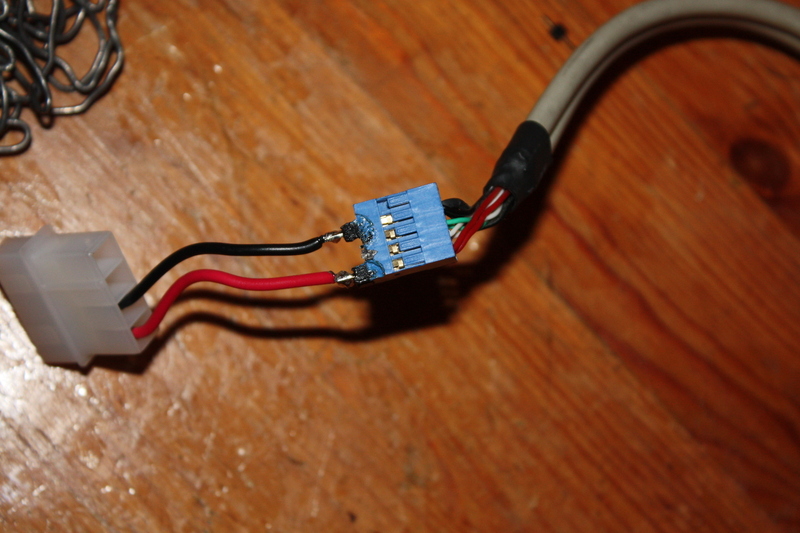 To look even more professional, you could solder the USB wires directly (cut off the header), use shrink tubing, and even wire a resistor in for those silly devices that need the TX/RX pins bridged in order to charge. I’ve been looking for a ready-made cable but it looks like I’d be better off just making it myself like you did. To bad they couldn’t have just keyed the higher-current devices and had slots that only work when the PC is fully on… 500mA ain’t a hell of a lot. Good point about joining the data pins for high-current devices, I only recently found out about that trick, I’d probably do that if I was doing this again. « Have we reached a plateau in computers? © 2013 Tobestool.net. For more information contact tobes@tobestool.net. Sitemap.